I use to think that scent was the most important part of having good bait. Meanwhile, I’m starting to change my mind. Scent is important, yet not the biggest factor when developing good steelhead bait. 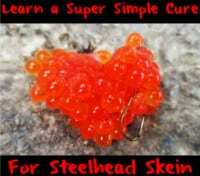 I’ve come to this conclusion after spending time using beads and still catching steelhead. The last few years our guide trips have seen increases in catch rates fishing beads for steelhead. In my opinion, in most cases beads out-fish other baits when fished side-by-side. However, cured roe is still an important tool. It’s helped me catch fish on days when beads didn’t work. With the success of beads I learned that presentation and color play larger roles than scent. Nevertheless, I also need the best bait (roe) to give the steelhead options. These days I look to achieve that by enhancing the roe’s color. I want the color to last longer and not wash out. The longer the color holds the better the bait fishes. Recently, I’ve experimented with a new egg cure that I’ve been satisfied with. It maintains color longer than the previous cures I’ve used. I’m going to use this blog to detail how I make this roe. I always start with fresh skeins. Bleed them the best you can. Removing blood from them prior to curing is critical. Like on many of our how-to blog I recommend butterflying them. Once butterflied, I tap them dry with a paper towel to clean up any dirt or blood. Depending on where you are fishing and water clarity you may choose to use Natural, Red, Pink or Orange BorX O Fire. In this cure I’m using Orange BorX O Fire. Sprinkle some of the cure into a gallon Ziploc. Then lay the skein in, sprinkle more cure on top and then shake in a little sugar. Repeat this process until all your skeins have cure and sugar on them. I prefer to add only a couple skeins per bag, but I’m fishing daily and call them “trip-size” bags, just enough for a day of fishing. You may choose to add more skeins and that’s fine. Once the cure and sugar is added it’s important to tumble the bag and massage the eggs. This ensures skeins and berries all get some of the cure. At this point I now add a few squirts of Fire Dye. In this case I used Orange Fire Dye, but you can switch the color of dye to correspond to the color of cure you are using. For example, red with red, pink with pink, orange with orange, etc. After squiring in the dye it’s important to tumble the bag in your hands and massage the eggs again. I want the dye all throughout the eggs just like the cure. I tumble periodically for a few hours. Then before bed I remove the air out of bag and let sit over night at room temperature. Next morning these skeins are ready to fish. While I continue to use beads daily I also never leave home without cured roe. This is how I’m curing my roe these days. The finished product is bait that offers durability, scent, UV color and that lasts multiple casts. It’s produced well this year and will likely do so for you, too. Editor’s Note: Veteran guide Kyle Buschelman operates Willamette Valley Outfitters. 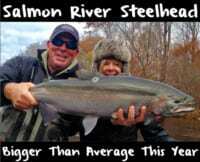 For more information on his guided steelhead trips please visit https://www.facebook.com/WillametteValleyOutfitters or http://willamettevalleyoutfitters.com.